We had a fun full weekend, and I thought about just throwing a few pictures up here and letting it tell itself. But of course I won't. Ha! When we get a glimpse of the bay rolling in the direction of 'our river', our stomachs get all knotty and our hearts lurch just a little. I cannot explain in words why this happens, but it does. Well I could explain in words, but it would take many, and I'm already planning to use more than my allotted amount. See how many I used just to explain why I can't explain? Very special friends, whose children grew up with ours, invited us down for a weekend of all things Maryland, aka-crabs-boating-water. They've just purchased a brand new boat, and wanted us to come play. We spent many a weekend together back in the day, our boat rafted up to theirs, the radio on, small people with purple noodles and bouncy pony tails splashing in the water beside us. We all get a bit of an achy breaky heart when we remember those magical summer weekends of yesteryear. Let's get back to present day which was positively splendid. We won't mention the boat hair. Ya just gotta deal people. We arrived at our friend's house early afternoon on Friday, loaded up in their brand new boat, and motored off. We meandered around a while before crossing the Bay into Maryland's Eastern Shore. We pulled into a spot called Hemingways for an early dinner, and in my opinion the only thing better than dining al fresco is arriving by boat. Hubs is in his happy place doing boat type chores. He misses owning his own, but it's just not practical for our crazy life right now. Soon though! I annoy him just a teensy little bit by saying things like park instead of dock, ropes instead of lines, and front instead of bow. Mostly though, he's just glad I love being on the water as much as he does. Quite often me and motion don't mix, but the rivers and Bay around Annapolis are like a tonic to my soul. My stomach seems to sense this and cooperates. The weather was glorious. Truly, a picture perfect day, so we sat outside and talked while having a leisurely meal. We let the water and the sounds and the scent seep into our pores. After dinner we flew back across the Bay into Annapolis. We love this town. If you take a trip to our nation's capital Annapolis makes a great side trip. There's a whole lot happening on the water in Annapolis on a Friday night. We 'parked' the boat, walked a bit, then headed back to 'our river' for the ride home. Saturday the weather was a little iffy, but we were on a mission to get crabs for lunch so back to the Eastern Shore we went. By car this time, to Harris's Crab House. You can get steamed crabs a hundred different places on our side of the shore, but we were going to a little party on that side later, so decided to eat over there. Plus you can't get these homemade nutty buddies on our side of the water, and we all wanted nutty buddies. Yes, it's as big as it looks, so we shared. Hubs makes fun of me, because everytime we have crabs I take the same picture. I can't help myself. The sight of these beauties makes me happy and it screams for a photo. 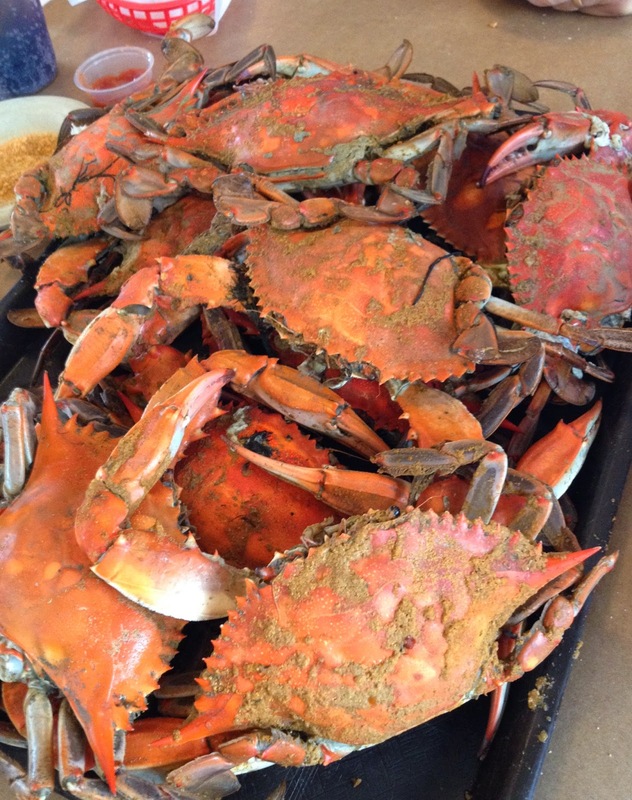 There is nothing better than Maryland blue crabs. 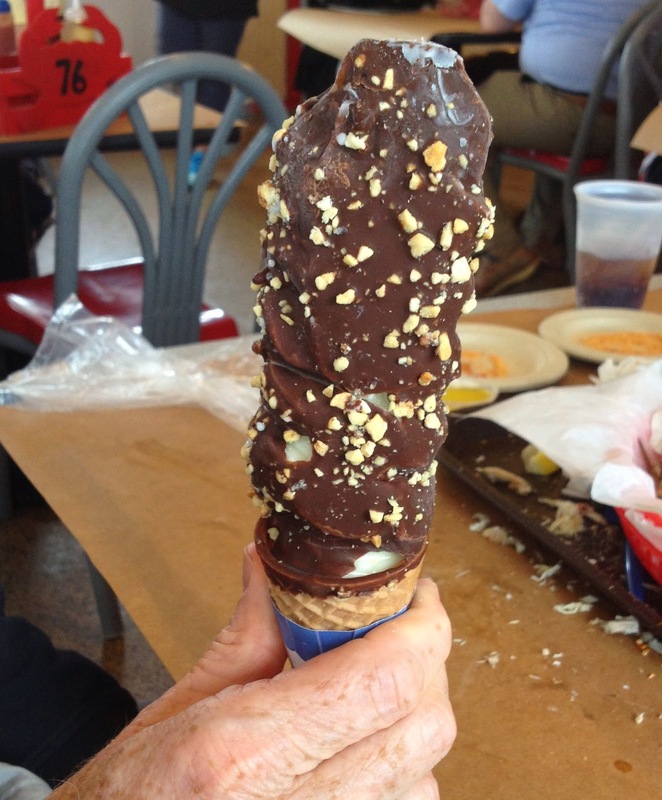 Except maybe the nutty buddy. Sunday morning I got up and had my coffee here. I need this every day. We took another boat ride around our old stomping grounds, and contemplated how difficult the re-entry into New Jersey was gonna be in just a few hours. Crossing that Bay Bridge heading home isn't nearly as much fun as crossing it in for a weekend on the water. So thankful for good friends and the ties that bind. That is one place I'd love to visit. I love the water and the boats. I could have a great time just watching them. That nutty buddy looks fabulous!! Love your pictures of your trip. It looks so beautiful and relaxing. Looks like you had a wonderful weekend! I have loved Annapolis since my brother lived there about ten years ago for a short time... It might be time for a return trip! You lead such an exciting life and I'm so glad that you share all your fun adventures with us. What a lovely, lovely weekend! Joyce, what an amazing weekend with friends. It looks like an amazing place to visit. I'm so happy for you and I would love one of those nutty buddies! What a fantastic weekend! Love your beautiful pictures. Looks so relaxing. Enjoyed your post. That ice cream looks simply amazing. What a wonderful weekend! Your hair looks great! I would happily trade boat hair like that for "humidity hair" here in Texas! The ice cream looks delicious. And my husband calls me nutty buddie!